Several environmental groups have a filed a lawsuit in Sacramento Superior Court seeking to halt approvals issued by the Sacramento Local Agency Formation Commission that would allow Elk Grove to expand its boundaries at the behest of housing developers. The lawsuit filed on Friday, June 1 by The Sierra Club, Environmental Council of Sacramento (ECOS), Friends of Stone Lakes National Wildlife Refuge, Friends of Swainson's Hawk and Habitat 2020 seeks to reverse the decision to approve a so-called sphere of influence application that would expand Elk Grove's city limits by just under two square miles. What's make this expansion unusual is that is has been initiated by private landowners, Gerry Kamilos and Martin Feletto, although the entire Elk Grove city council has signaled their support of the plan. 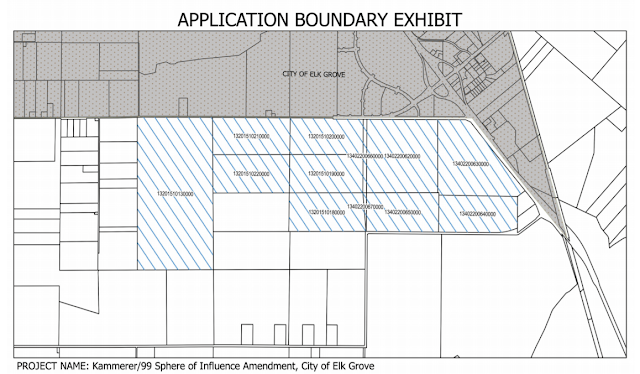 "Numerous legal errors occurred in the Commission’s consideration and approval on a 4-3 vote of this landowner-initiated amendment to Elk Grove's potential boundary. The decision permits previously protected farmland to now be considered for annexation into the City," Don Mooney, a Davis-based attorney for the plaintiffs said. "My clients represent the public interest in curbing sprawl and preserving farmland in this region." The initial approval by the Sacramento LAFCO was on February 7 by a 4-3 vote. On May 2, again by a 4-3 vote, the LAFCO board to deny reconsideration of their earlier approval. The land being sought for annexation lies on the city's southside, just west of Highway 99 and south of Kammerer Road (see map above). Environmental and agricultural interests have sounded alarmed contending the expansion encroaches or farming as well as an environmentally sensitive habitat area in the Cosumnes River floodplain. "Although the Sphere of Influence Amendment is just the first step in urbanization - no dirt will be turned soon - the Environmental Impact Report identified 22 significant and unavoidable impacts from this decision that cannot be mitigated," Ralph Propper, President of ECOS, noted. "This is a damaging land use decision that threatens the health of our community." This is not the first time Elk Grove has sought to expand its city boundaries in the hopes of developing more housing tracts. In 2013 a city-initiated expansion that would have annexed about 12 square miles was denied by the Sacramento LAFCO. Since that time the membership on the Sacramento LAFCO, which is comprised of a board of seven members who hold various elected positions in Sacramento county entities, has changed. One member of the Sacramento LAFCO board is Elk Grove City Council member Pat Hume, a leading proponent of Elk Grove's previously failed expansion. With a more developer friendly composition, the board, now chaired by Hume, are amenable to expand urbanized areas notwithstanding current infill stock throughout the county. In his role as Sacramento LAFCO Chair, Hume did not respond to an email request seeking comment on the lawsuit. LAFCO's were formed in 1963 by legislatures and exist in each of California's 58 counties and were initially intended to "discourage urban sprawl and encourage the orderly growth" and "prevent premature conversion of agricultural and open space lands." Sacramento's LAFCO, which is led administratively led by Don Lockhart, has also been widely criticized for his lackadaisical and often cozy relationship with developers, who he and his staff charged with overseeing. "There are over 4000 vacant acres zoned for new development within the City of Elk Grove, including 1800-acres with residential project approvals that remain unbuilt. Some projects were approved over ten years ago and remain unbuilt," Jim Pachl, Sierra Club Mother Lode Chapter Legal Chair said. "Lent Ranch Mall remains a half-built shell. LAFCo lacks a legitimate reason to allow a conversion of farmland for expansion of Elk Grove's footprint." No court dates as of this posting have been scheduled. UPDATED 6/6/18 10:30 a.m. - The story was updated to show that Friends of Stone Lakes National Wildlife Refuge, Friends of Swainson's Hawk and Habitat 2020 are named plaintiffs in the lawsuit. Better call Kronick and Moskovitch!